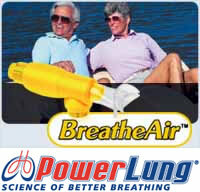 The PowerLung BreatheAir provides a light respiratory strength training workout at a low level of resistance. The PowerLung BreatheAir offers users the capability to begin low resistance strength training for their breathing muscles. Many users say that after about 5 days of daily PowerLung use, they can feel the difference. They are breathing deeper, stronger and are less breathless. Users tell us they have begun to exercise more regularly and really enjoy it. Younger users find greater proficiency in breath control for singing or band playing and practices. As you can see, anyone of any age or level of activity can benefit from beginning respiratory training with the PowerLung BreatheAir.